I edited fourteen pages yesterday, of size 11 Tahoma with narrow margins. It was hard work. I was going to tell you about that, but it seemed pretty obvious, since that’s what I always say. So, I’m going to talk instead about my USB pen. My USB thinks it’s a hard drive. I’m not sure why, because we reformatted it several times when we first wiped the company information off it and gave it to me (yes, I use a free USB. It’s called economising). It should probably have worked out pretty quickly that it was just a pen drive, but it doesn’t seem to have caught on. You see? 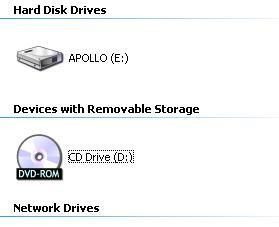 Not only is it called ‘APOLLO’ (and although it was me that named it, I only called it that because that’s the company it’s from), it thinks it’s a hard disk drive. You’ll see that it appears to be the ONLY hard disk drive in the computer. It’s a school computer. They’re on a network. That makes them do strange things; don’t ask me how it works, for I haven’t a clue. I tried for quite a while to persuade the USB to behave like any other USB, but it didn’t work. In the end, I got so used to finding it in the Hard Disks section of My Computer that when I use somebody else’s USB it takes me several moments to find it, because I’m looking in the wrong place. So, you got any issues with technology? Wait, no. Stupid question. Doesn’t everyone? Hey, people! I try and post every Thursday and Sunday, though I usually don’t manage it and write on different days. But you know, if you think a routine is needed to find my posts, you’re wrong. Just subscribe, and you’ll always know! The first one is smaller, and I always have to delete the things on it and re-send them because it doesn’t like my files and folders system to be updated and scrambles it every time I send the documents over. Ninja USB. I like it. I think mine would do a better job at being invisible if it wasn’t sort of fat and white with a logo on it. But I can imagine that from yours. After all, you’re like the ultimate ninja. You vanished off Facebook!